Americans spent almost $338.1 billion on clothing and footwear in 2010 (data here), which as a share of disposable personal income (data here), was the lowest ever in U.S. history, at only 2.97%. Spending on clothing as a share of income has fallen in 21 out of the last 23 years, from 4.78% in 1988 to less than 3% in both 2009 and 2010. Compared to 1950 when spending on clothing was 9% of income, spending last year was less than one-third that amount, and compared to spending on clothing of 6% of income in 1970, spending last year was half of that share. 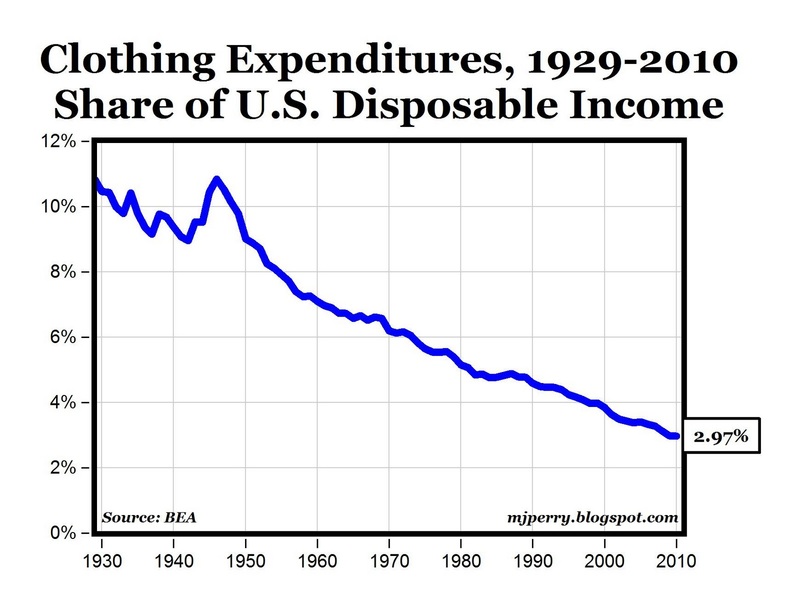 In other words, clothing is now cheaper than at any time in history, when measured as a share of disposable income. And there's a better selection of clothing now, at higher quality, and with options available today like no-iron fabrics and washable silk that have become increasingly available in recent years. And when it comes to footwear, I don't think anybody would argue that the selection and quality today are far ahead of past decades - just think of the athletic footwear options today vs. Chuck Taylor Converse All-Stars, which were at one time "state-of-the-art" and were only available in two colors (black and white) until 1966. Bottom Line: As a direct result of increased global competition, advances in technology, and increased worker productivity, clothing is cheaper today both in inflation-adjusted prices and as a share of disposable income. We have more clothing today per person than any previous generation (think of the number and size of closets in a typical 1930s, 1940s or 1950s era home), and the clothing and footwear are cheaper and better than ever, contributing to an ever-increasing rising standard of living for the average American. I can buy wool caps for $1 at the local 99 cent store. Also toothpaste, btw. Morgan will say that means I am a liar, I do not understand economics, and that we have under-reported inflation. And that I am a poor writer. "I don't think anybody would argue that the selection and quality today are far ahead of past decades"
Let me preemptively point out what will be said on this momentarily. You're wrong. The quality has decreased. There's probably some hormones injected into those shirts. A shirt in 1930 would last you 15 years. Today it falls apart after washing it 5 times. Plus, the portions are getting bigger. A "medium" in 1930 was the equivalent of an XS today. Companies are cheating us through packaging gimmicks, and government lies do not capture these attempts to fool us. How are things getting cheaper is a shirt in 1930 would last 15 years, while now it lasts 1 year? Lies I tells ya! Plus, on a trip to Thailand, I saw that shirts there were only 20 cents, and...I don't know I lost my train of thought. If selection and quality are better today, how come I cannot find a decent Nehru jacket to go with some new bellbottoms? And how come all the new clothes make me look fat? so you guys buy into the idea that all the clothing has all gotten better? why is it that the j crew sweaters i bought in the 80's are still in great shape, but anything bought from them int he last decade falls apart in a year or two? i would not argue that there have not been improvements, but to argue that quality at places like gap and abercrombie etc has not fallen off a cliff is just untrue. the reason brand like old navy and ralp loren "rugby" or armani "exchange" were created was to allow for a significant drop in quality (and price) without polluting the name brand. their management teams openly admit this. it was THE hot strategy 5-10 years ago. donna karen black label is still great stuff, but DKNY is trash and will fall apart in months. has that been accounted for in all these quality adjustments? "Morgan will say that means I am a liar, I do not understand economics, and that we have under-reported inflation. And that I am a poor writer." ahh benji, sarcastic misdirection, the last refuge of he who has no data. this: "And that I am a poor writer." was either a wonderful piece of self deprecating humor, of which, alas, i do not believe you capable, or a perfect example of what i mean about your writing. 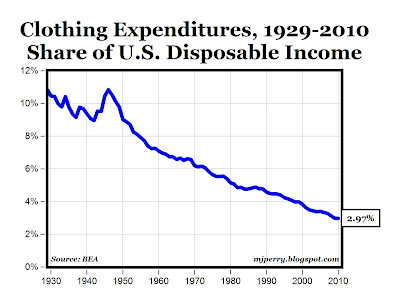 per capita disposable income in the US was $4129 in 1972. it was $27,640 in 2005, 6.7X as high. take 2.97% X 6.7 and you get 19.9, far higher than the 6% number from 1972 on the chart. thus, there has been a fair bit of inflation and clothing is, in fact, 3.3X the price it was in 1972.
so much for the "no inflation in clothing" argument. this entire trend was driven by increased disposable income, not by a drop in clothing prices. "why is it that the j crew sweaters i bought in the 80's are still in great shape, but anything bought from them int he last decade falls apart in a year or two?" "their management teams openly admit this. it was THE hot strategy 5-10 years ago." :) Oh my goodness! I should be a psychic for predicting so accurately what would be said here. I have amazed even myself. ":) Oh my goodness! I should be a psychic for predicting so accurately what would be said here. I have amazed even myself. " alternately, you could try mustering some data as opposed to just ad hominem. do you really believe that every product gets better over time? No one is saying that in nominal terms eggs and clthing are priced lower today than 30 years ago. We are all saying that adjusted for inflation, eggs and clothing are cheaper than ever. Persist in this fashion, and you will end up with egg on your face. Aren't you grasping at straws. After all, we have photographic evidence of how badly the unemployed workers were in the 1930s. Don't tell me that ordinary people can't afford better suits today. Ok, so the percentage of disposable income used for clothes and food has gone down. So what has gone up? "We are all saying that adjusted for inflation, eggs and clothing are cheaper than ever." no, that's not what you are saying. the clothing figure is relative to disposable income, not inflation. persist in making such rudimentary errors and it is you who need to worry about egg on your face. regarding eggs, claiming they have underperformed inflation is not terribly meaningful. as the 6 or 7 other breakfast commodities i linked to demonstrate, eggs are not typical. you can always cherry pick a commodity if you look long enough, but most of the others (and the commodity indexes) all disagree. using eggs to stand for food is like my claiming health care costs stand for all services.